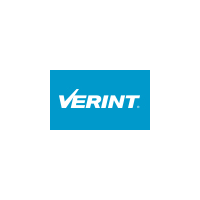 Verint® (NASDAQ: VRNT) is a global leader in Actionable Intelligence® solutions. In today’s dynamic world of massive information growth, Actionable Intelligence is a necessity for empowering organizations with crucial insights and enabling decision makers to anticipate, respond, and take action. Today, more than 10,000 organizations in 180 countries, including over 80 percent of the Fortune 100, use Verint solutions to help address three areas of the market: customer engagement optimization, security intelligence, and fraud, risk and compliance.